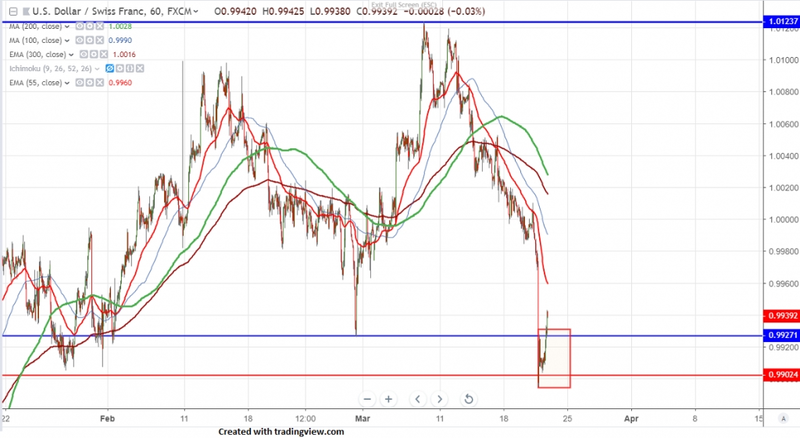 USDCHF shown steep fall of more than 100 pips yesterday after Fed monetary policy meeting.Fed has kept its rates unchanged at 2.25-2.50 and downgraded growth forecast for 2019 from 2.3% to 2.1% and 1.9% in 2020. The Central bank dot plot confirms that there will not be any rate hike in 2019. Swiss Central Bank (SNB) kept its deposit rates unchanged at -0.75% and mentioned that Swiss France is highly valued .It has projected its growth outlook for 2019 unchanged .But it has downgraded inflation outlook 2019at 0.3% from 0.5%.The pair hits low of 0.98944 and is currently trading around 0.99282. On the higher side, near term resistance is around 0.99455 and any violation above targets 0.9972 (100- day MA)/1.0000/1.0030. Any break above 1.0060 confirms minor bullishness and a jump till 1.010. It is good to buy on dips around 0.9925 with SL around 0.9890 for the TP of 1.000.